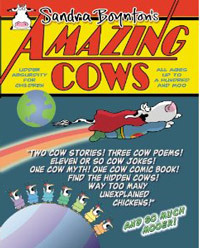 What happens when cows try to speak Spanish? 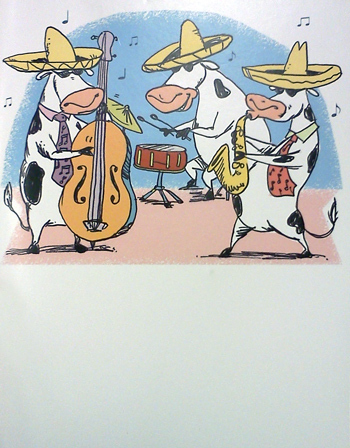 I was recently browsing the birthday cards at Target when I found this one, with several cows playing music on the front. 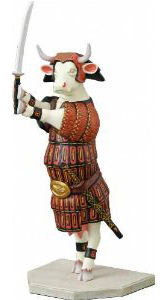 First I thought they were jazzy cows. How could I go wrong with the saxophone and the bass players? But then I spotted the sombreros. Wait? Are these mariachi? When I opened the card, I found out I was right about both! Apparently, it’s a jazzy mariachi band. And while I didn’t record the music that came out of the card, I can tell you I closed the card back pretty quickly. As for the text on the inside of the card, it took me a while to figure it out. 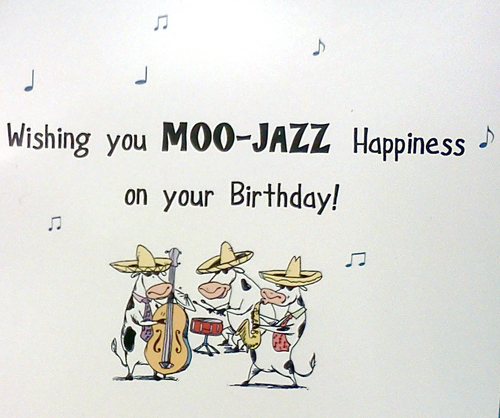 I’m guessing it’s says “moo-jazz” for “muchas”. Am I right? Does this look as bad to you as it does to me? LOL – its just awful haha! Isn’t it? It really took me several minutes to figure out the play on words. It couldn’t understand what was supposed to be funny!